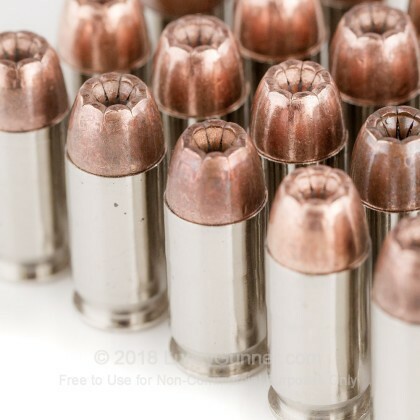 Jacketed hollow-point bullets are designed for maximum energy transfer upon impact and controlled expansion during penetration. The nickel-plated cases are designed to help prevent corrosion over time. 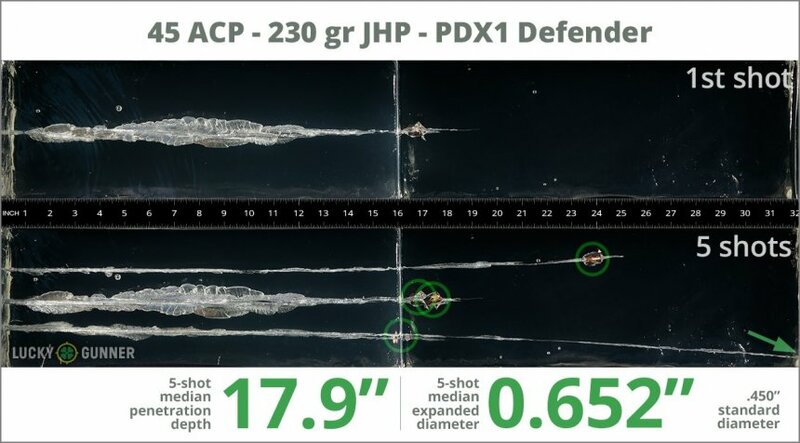 In order to find out how different self-defense handgun loads perform, we decided to do some ballistics gelatin testing of our own. The chart below is a compilation of expansion and penetration data for Winchester 230 gr PDX-1 fired from 10 feet, through four layers of fabric (to simulate clothing), using a Kahr CW45 pistol. The diagrams at the bottom of the page can give you an idea of how this load compares to other .45 ACP (Auto) self-defense loads that we tested. Testing the Winchester PDX1 bonded 230 gr. Amazing round... Shoot few random objects and it just destroyed them... in simple words... it will stop attacker for sure. I'd been looking for this stuff for a couple weeks. 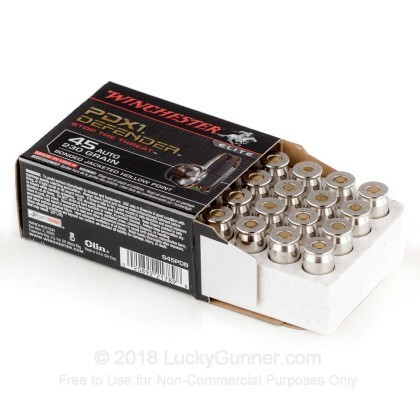 I bought these for home defense so I have not shot them yet, but I have always used Winchester supreme ammo for home defense and it has always worked well. Thanks Lucky Gunner for the great service again. This defensive ammo was accurate and shot flawless in my 1911. Good,hard hitting. These rounds are premium and functioned flawlessly in my Springfield Stainless Mil-Spec 1911. 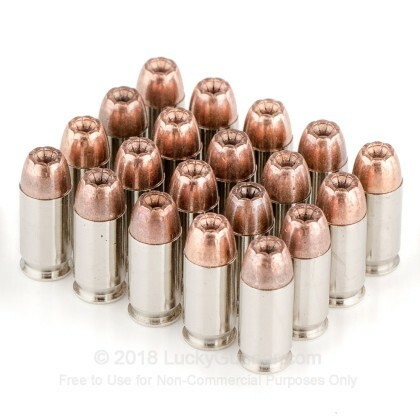 While the price prohibits them from regular range use, I carry these rounds in my weapon at all times. While some say they are just repackaged Ranger-Ts, I can say that they are hard hitting and obviously bonded. I conducted water barrell testing (absolute best case scenario expansion) and the round performed flawlessly and after quite a few rounds fired, no malfunctions through my Kimber Pro Carry II. 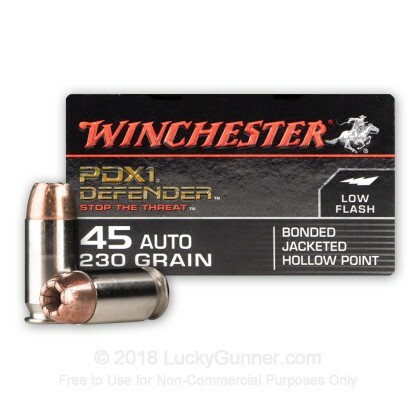 I highly recommend this ammo! I bought these to be used for home protection. A: Hello Andrew! 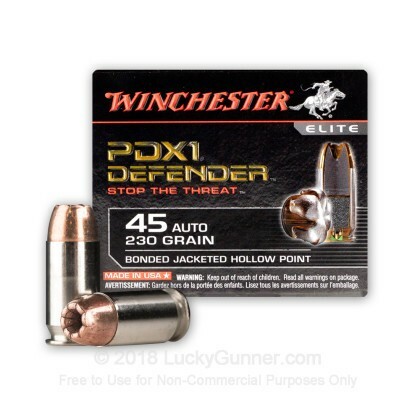 The Winchester PDX ammunition has a muzzle velocity of 920 fps. We also have this 45 ACP - 230 gr JHP - Winchester Supreme Elite- 200 Rounds ammo in stock in a bigger quantity.